Antrim senior football manager Frank Fitzsimons has drafted in former county defender Gearoid Adams and ex-world boxing champion Brian Magee as part of his managerial team for 2016. Adams will be joint manager next season, while west Belfast native Magee is the squad's new fitness coach. 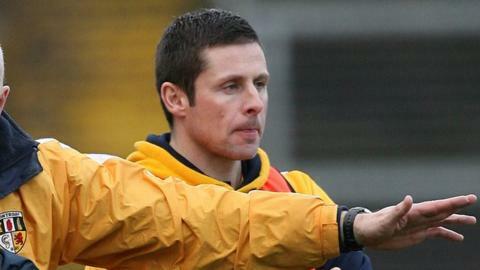 Adams previously assisted former Antrim manager Liam Bradley and was boss of Down club Clonduff this year. Former super-middleweight champion Magee last fought three years ago. Magee effectively replaces Mike McGurn, who worked with the squad last season, while Gerard McNulty will look after the county's Under-21 squad alongside Sean McGoldrick. He follows in the footsteps of former world boxing champion Bernard Dunne, who is a key member of Jim Gavin's backroom team at Dublin. Adams enjoyed a 13-year playing career with Antrim, before managing his club St John's for four seasons. Mickey Pollock and Tony Scullion are the only players to leave the Antrim squad, but Fitzsimons is hopeful that some established names will return to the fold next year.